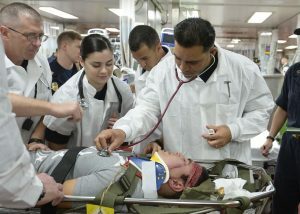 “Mercy conducts mass casualty exercise during Pacific Partnership 2015 [Image 12 of 12]”, by Mayra Conde, identified by DVIDS, is released in the Public Domain, via Wikimedia Commons. About this photo: PHILIPPINE SEA (July 16, 2015) Crew members on board the hospital ship USNS Mercy (T-AH 19) conduct a mass casualty drill during Pacific Partnership 2015. The goal of disaster preparedness is to plan a response that will decrease the damages and support the recovery from a disaster (Stopford, 2007). Nurses, with their expertise in primary health care, extensive experience with interdisciplinary teamwork, and strong collaborative skills are the ideal leaders in disaster preparedness. The first step in preparing for a disaster is developing a strategic emergency management plan (SEMP) (Public Safety Canada, 2016) in anticipation not only for those disasters that are most likely to occur in a specific geographical area, but also those that are unexpected (Saunderson Cohen, 2013). planning standard response to threats. For detailed information on SEMP, refer to Annex A of the Emergency Management Planning Guide, 2010–2011, published by Public Safety Canada. 1. Determining a command and control plan. When determining a line of command, it is essential to ensure you have both a command person and a second-in-command, should the situation arise that the primary commander is unable to fulfill the role. The control plan must also include the designation of a specific location for the command centre. 2. Identifying the functional roles and responsibilities of internal and external agencies. Internal and external department need to have a clear understanding of both their roles and responsibilities and other parties’ roles and responsibilities during a disaster. Contact information of emergency personnel, along with their roles should be readily available. Additionally, essential service staff should be defined, thus ensuring that there is consistent emergency staff coverage during the disaster. 3. Determining a communication system. A standard process of communication must be developed to address the possibility of system failure. The contingency process should include the use of land lines, cellphones, and radios as standard communication equipment. 4. Confirming a legal basis for response to include isolation strategies as needed for infection control. Disaster preparedness must include details for the processes of isolation, infection control, and allocation of medications such as vaccines, antibiotics, and antiviral agents should they become short in supply. Additionally, should there be a need for facility lockdown and controlled facility access, legal and ethical concerns need to be considered when developing this portion of the plan. 5. Developing an infectious disease plan. Standard process needs to address the potential for an infectious disease outbreak or pandemic. Different illnesses require different levels of isolation and personal protective equipment (PPE). Disaster preparedness addresses the possibility of high-level isolation equipment requirements and ensures adequate supplies and equipment are readily available. Emergency care providers should be familiar with clinical signs of different diseases, and a surveillance methodology plan should be in place to address possible advancement of the disease process. 6. Obtaining and maintaining emergency facilities, equipment, and supplies.Emergency preparedness requires a standard process for obtaining and maintaining emergency equipment and supplies. This includes a standard maintenance schedule, a tracking schedule of where equipment is located, and details where to obtain additional equipment and supplies. Training should occur on a regular basis and should be included in regional orientation for all personnel. Individual facilities require additional planning on the steps to take if a disaster disrupts their day-to-day facility operations. This planning is directed at facility leadership and personnel and provides a standard process for ensuring facilities can continue to provide regular essential services (Saunderson Cohen, 2013). Additional considerations suggested by Stopford (2007) include planning for a lockdown of the facility. Staff may be required to remain in the facility, and if so, they need to be trained to develop a contingency plan for family emergency planning.